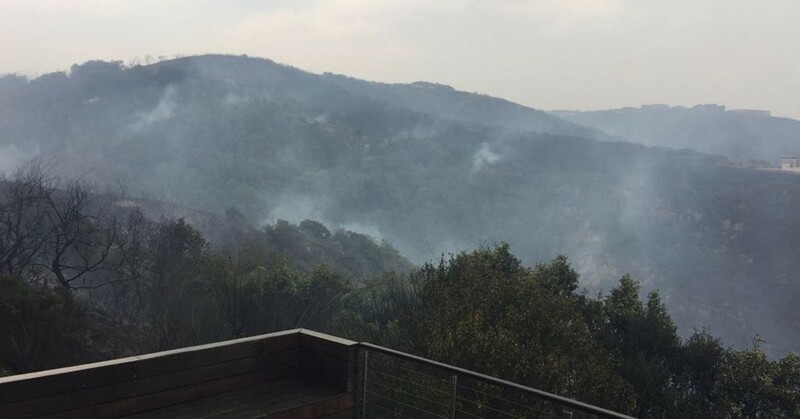 Traumatic times in Knysna as a combination of hot temperatures and heavy winds resulted in many fires across the region of Rheenendaal, Belvidere, Brenton, Knysna and into parts of Harkerville and Plettenberg Bay. Many suburbs’ residents were evacuated to safety through the course of the day and night yesterday where the local communities got together everywhere to help by offering transport and a place to sleep to keep them away from any danger. The DPM team were working through the night personally visiting all our guests and checking on the status of all our accessible properties. We were restricted access down to Noetzie beach unfortunately but we went as far as we possibly could both last night and this morning however the firefighters are doing what they can and keeping us informed. Pezula and The Heads were quite badly effected but we set off sprinklers where we could and luckily no damage to our rental properties occurred there or in Plettenberg Bay. Leisure Isle and Thesen Isle were not effected. We will be carrying out an extensive cleanup programme to rid the houses of ash deposits and tidy up the gardens from the wind and smoke over the next few days and we will be carrying out detailed inspections of all our properties and then help others wherever we can. For any updates or if you have any concerns about your holiday reservations at our houses, please contact us and despite intermittent internet drops, we will do our best to reply to everyone as quickly as possible but please rest assured that currently no bookings should be effected in any way to the best of our knowledge.